In the Spring of 1978 my husband, Robin, myself and our young baby Mark, eagerly set off to explore the new Milton Keynes we had heard about. It looked the perfect place with its redways, beautiful parks and lakes along with a good transport system. A great place to set up home. We moved to Withington in Bradville in 1978. New homes where being built at the end of Bradwell Road. Withington was the final road built after Eston Court, Bishopstone and Wallingford. Withington is last road that joins one end of Bradwell road. As I was expecting my second child, I went to Stantonbury Health Centre for ante-natal visits, along with monthly visits by train from Wolverton station to Northampton hospital. Milton Keynes hospital had not yet been built. 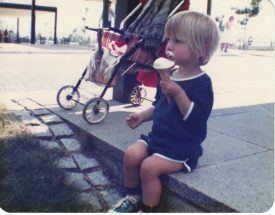 Not having a telephone meant I was very worried about going into labour in the middle of the night as Mark, who was only two years old and my husband worked away. However nearer the due date, my Mother-in-law came to stay, having taken time off her work as a GPO telephonist in Stevenage. 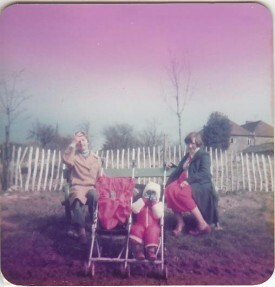 Here are photographs of us on the green in Bradwell just before Christian was born. 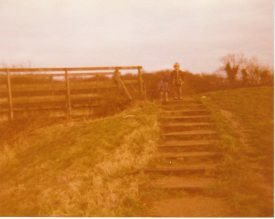 There was no shopping centre, so I usually took the bus into Bletchley for the shopping, or sometimes we would walk across the wooden bridge and over the fields (which are now Bancroft) to Wolverton. 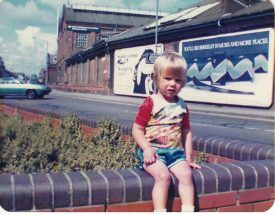 The above photograph, taken in Stratford road, Wolverton shows Christian sitting on the wall, with Wolverton Works in the background. It’s seems strange to see the billboards advertising cigerettes which is illegal today, but was nothing out of the ordinary at the time. Later I worked in the community, based in Bletchley, and I will always remember visiting a couple of very elderly spinsters who lived in The Old Bakehouse, Great Brickhill. I took my 9 year old son for a walk down memory lane. I came home and found this. 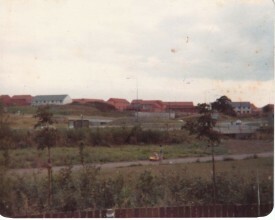 We lived in Eston court around 1976 I think. 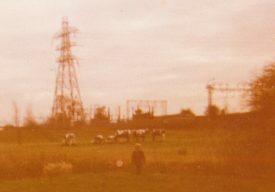 We moved to Bradwell road (opposite Wallingford) in 1982. We stayed until 1986 when we moved to crown hill. Your story sounds so familiar. Remember lots of playing in the green areas,walking through the yellow fields over the wooden bridge. 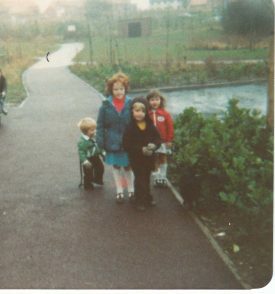 Went to school in new bradwell,and my mum was caretaker of the green hut. I have such good memories of my time there. Mathieson centre for brownies and roller skating. We even used to have Halloween and bonfire night there. 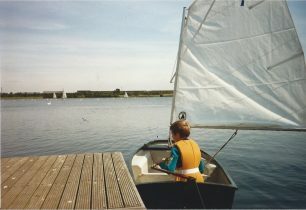 My son said, mum you had such a lovely childhood,in a lovely place. I could not have said it any better. 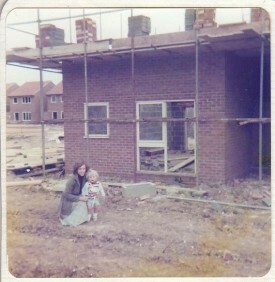 We moved to Withington in June 1978 when the some of the houses were not yet completed. We lived at no 30 and our lovely neighbours the Boodens at no 32. Our daughter Julie was born 1981 and we left to return to York in 1983. We enjoyed our time in MK and have many happy memories of the concrete cows and cycling on the red way. We met lots of lovely people who lived in Bradwell and we were sad to leave. 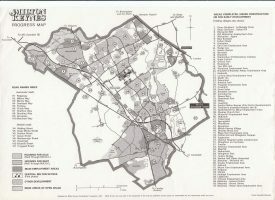 I came across this article when I was looking for any info on the time Withington was flooded after a big thunderstorm!! 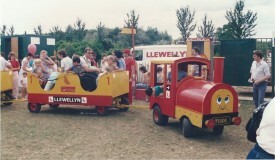 My family moved to Harrowden, Bradville in 1978. 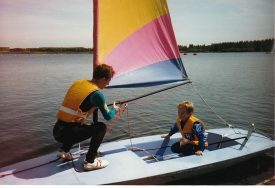 I was just 5years old. But I still remember the greenness and open space! Our new house felt massive! We lived there up untill the mid 80’s. I was so sad to leave. We went to Pepper Hill first school and Stanton Middle.